Bruce Lee is gone, but his movies live on. That, and memorabilia, including his most iconic outfits, which are up for auction in Hong Kong,. The marquee item is the trademark yellow jumpsuit, one of two Lee wore in Game of Death, his last film. Reuters reports that four jumpsuits were created, but the other two were worn by a stuntman. This year marks the 40th anniversary of his death. According to AP, a tailor in Hong Kong custom made the jumpsuit, but it was washed after filming, causing the garment to shrink 15cm. It is expected to fetch from HK$250,000 to HK$300,000 (US$32,000 to US$39,000). 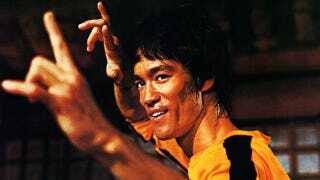 Other items include a drawing, a pendant Lee designed, and nunchaku also used in Game of Death.